If you’re a college student, you should have a bike! Whether you are a freshman heading to campus for your first year or you’re finishing up your final year of grad school, having a bike in college will make your life better. 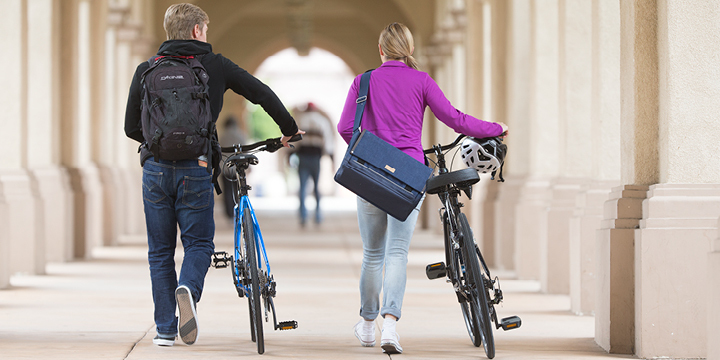 Here are 10 reasons why every college student should have a bike! Save Money $$$ – Every penny counts in college. Having a bike can help you save a lot of pennies! No need to pay for gas, oil changes, insurance or parking passes. Not to mention, bike maintenance is much cheaper than fixing a car, and many college campuses have bike co-ops or shops on campus. No Car, No Problem – That’s right, a bike works just as well as a car — or even better at college. You can get from your apartment or dorm to class in no time. Rain or shine, your bike will get you there! Help the Environment – We all know that cars emit noxious gasses, and bikes emit none at all. Reducing your carbon footprint by replacing car trips with trips by bike is a great way to do your part. Good for the Mind & Body – Riding your bike can be relaxing. It’s your chance to unplug from your phone and enjoy the smell of the air, the wind in your face, and a sense of freedom. It’s your mind’s time to just get away, all while getting a little exercise at the same time. It’s a perfect combination! Get to Class Quicker – Trying to get to campus on time? Don’t worry, with your bike, you will make it! There is a limit to your walking speed, and the bus stops and goes, and stops and goes, and stops and goes… On a bike, if you are in a hurry, pedal faster! Parking Is Easy – Don’t waste your time circling the parking lot in your car and looking for a parking spot by tracking down fellow students heading towards their cars. Rather, just roll up to the nearest bike rack. Most campuses are full of bike racks. Just be sure to use a proper lock for your bike. The last thing you want is for your bike to get stolen. Haul Your Books to Class – Save your back and use your bike rack! Load those books into your bike rack, basket or pannier and cruise across campus at ease. You can even haul your groceries home on your bike. Load ’em up! A Great Way to See Your College Town – Hop on your bike and explore your college town. Meet your friends for coffee or happy hour at the new hotspot in style! 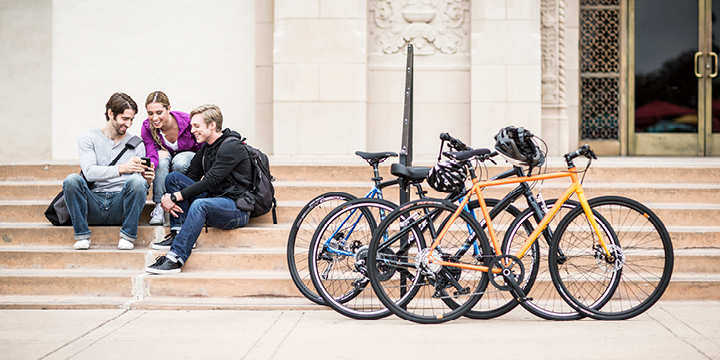 Bike Together – Grab your friends and ride over to the coffee shop to study. Bikes are a great way to bring you and your friends together. Or get going to soccer practice, club meetings, wherever your activities take you. Even going to the library is more fun when you do it with your friends on bikes! Why Not Just Bike! – When you add it all up, having a bike in college gives you so much: more money in your pocket, more time, more energy, more fun with your friends, and more freedom to get around when and where you want to.